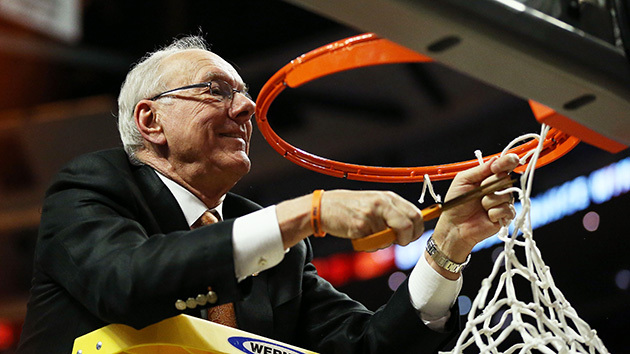 A year after a self-imposed postseason ban and just months after its coach's nine-game suspension, Syracuse has reached the Final Four. CHICAGO — “Take care of this,” Jim Boeheim said. With that, the 71-year-old Syracuse coach handed the Midwest Region championship trophy to Griff Hopkins, the teenage son of his top assistant coach, and left the court. He ceded a floor teeming with bliss and disbelief, after the most unfathomable moment in an operatic season, a thundering crescendo in a Boeheimian Rhapsody. His team had beaten No. 1 seed Virginia. His team was going to the Final Four of an NCAA tournament it arguably didn’t deserve to be in. Standing there for another minute wasn’t going to help process it. Probably none of the minutes across his four decades of coaching were going to help explain it. So he walked off, half-smiling, as everyone cut down the net behind him. The result they were celebrating was clear. 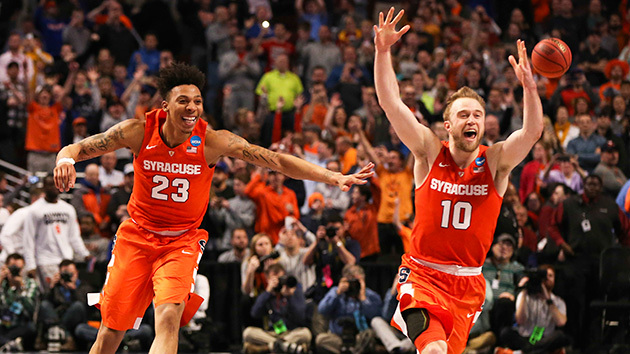 It was Syracuse 68, Virginia 62, and the Orange were one of four teams left to play for the national championship in Houston later this week. That much didn’t require reflection. The horn sounded and the midcourt flash mob at the United Center unfolded, with family and friends and former players trickling out to take pictures and video and receive more than a few sweaty hugs. It’s like Boeheim tells his players: In this tournament, it’s just one game. And if you can win just one game, you get another chance. They earned another chance, so they earned some more revelry. The reasons underwriting the celebration were more complicated. Was it because they didn’t even have this opportunity a year ago, a self-imposed postseason ban wiping out March before there was even a thought of April? Was it because the head coach was forced to sit out nine games this season? Was it because they spent Selection Sunday overwhelmed with nervous uncertainty? Was it because of the No. 10 seed affixed to a program unaccustomed to No. 10 seeds, and the expectation that they wouldn’t last a weekend, let alone three? Was it because they were done, twice in Chicago, until they weren’t? Was it because they were outlaws sneering at all those who tried to break them? Or because they were the afflicted, rising above to a moment they deserved? Was it anything that anyone could make sense of, even if they tried? The year was just about over, because Syracuse was smothered and aimless for a very long time on Sunday. In the first half, against Virginia’s exceptionally blunt defense, the Orange managed two baskets on first shots out of true half-court sets. Their other six baskets were fast-break scores and putbacks. They missed eight of nine attempts from three-point range. The seven turnovers that Syracuse forced were nice, if only it hadn’t committed eight of its own. This was offensive lockjaw, and it resulted in a 14-point deficit at the break. On 68 previous occasions, Virginia teams under coach Tony Bennett had built halftime leads of 10 or more points. They had won all of those games. “It was in our grasp,” said Bennett, who appeared set to lead the program to its first Final Four since 1984. So, for Syracuse, a few things had to change during the intermission, one of which was Malachi Richardson. Boeheim approached the 6'6" freshman, the team’s second-leading scorer on the season, for a discussion in the locker room. And Richardson, after a two-point first half, was pretty sure how the discussion would proceed. “I was like, man, I’m getting yelled at again,” he said. “I just can’t stop getting yelled at.” Richardson would not specify exactly what his coach said. But it was not private—“Nah, he does it in front of everybody,” Richardson said—and the message focused on the idea that a passive offensive approach and a two-point half was not good enough. You would have forgiven Richardson for wondering if he had offended the spirits in the building. Last April 1, as a consensus top 30 recruit out of Trenton, N.J., he was a participant in the McDonald’s All-American Game held here. In an exhibition not exactly renowned for defensive wherewithal, Richardson took six shots. He missed all of them. “That was a struggle of a game for me,” he said. Richardson went on to reach double-figure scoring in 29 of 35 games for Syracuse before Sunday while ranking third among Syracuse freshmen alltime with 74 three-pointers on the year. But along with the 3-for-14 accuracy against Gonzaga in the regional semifinal, shooting in the House That Jordan Built resulted in less than banner nights. Down 15 midway through the second half, Syracuse unleashed the same full-court pressure that rattled No. 11 seed Gonzaga out of rhythm on Friday and eventually spurred a complete meltdown from the Bulldogs. The effect was less emphatic on the Cavaliers, who alternated between fumbling the ball away and finishing easy looks at the rim in transition. More than anything, really, the press somehow ignited the Orange’s dormant offense, fueled by Richardson’s eruption. He hit a step-back three-pointer with seven minutes to play, then stole the ball to set up fellow freshman Tyler Lydon for another three. He drove to the bucket for the go-ahead score with 5:50 to play and followed that with a three-pointer to make it a four-point game. As Richardson bounced back down the court, he looked at the Syracuse fan section, which included former players like Rakeem Christmas, Tyler Ennis and C.J. Fair, and issued a proclamation against the Cavaliers. “They can’t guard me!” he shouted. When he put back his own miss off a drive one possession later—eschewing a three-point attempt despite members of the Syracuse fan section shouting “Let it go! Let it go!” at him—it capped a nearly inexplicable 15–0 run. Richardson had accounted for 21 second-half points. A mercurial freshman who had failed time and again under this roof eviscerated a stout, experienced Virginia team that entered Sunday with the eighth-most efficient defense in the country. A first-year player coming off two straight middling NCAA tournament efforts—a combined 14 points against Middle Tennessee and Gonzaga—rescued a team driven by veterans like Cooney and senior guard Michael Gbinije. “Malachi is a monster,” Cooney said. So there was Lydon, with an 11-point, six-rebound, five-block night against Virginia that included one three-pointer stroked with one shoe off. (It had left his foot accidentally and Gbinije tossed it to the sideline.) There was Richardson, firing all evening as he lifted his team to the Final Four. 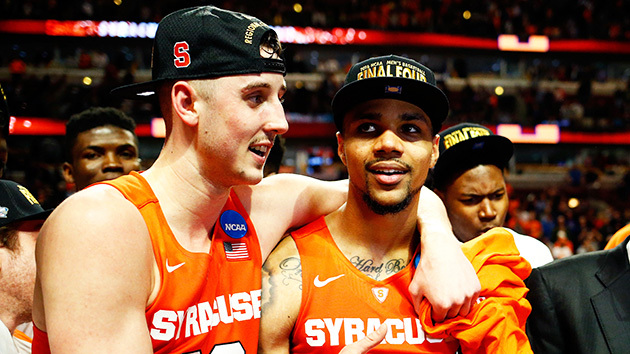 Two players who represent the future of Syracuse basketball had every reason to be somewhere else this season. And here they are. No place they’d rather be. For all of Syracuse’s road trips this year, Gbinije, the team’s 6'7" leading scorer, packed a video game console. At some point during those trips, his teammates would gather in his hotel room to partake in some digital distraction, competing and bonding. But Gbinije also controlled what was played and took no suggestions. Thus the Orange players found themselves battling in WWE- or UFC-themed games. “It’s like a safer Fight Club,” Gbinije said. This is what will define Syracuse in the end, no matter what transpires in Houston: The ability to balance being at ease and being relentlessly aggressive. Still, they might not have expected this. Gbinije copped to goosebumps as he climbed up to snip off his share of the net. Cooney said he did dream about the moment, but struggled to find the words explaining the vision. Even the coach’s wife, Juli Boeheim, stood amid the festivity on Sunday evening and said the score was almost irrelevant. Merely arriving in the Elite Eight was satisfying enough. “Come what may today,” she said, “this was a celebration.” But since the win came, the celebration grew exponentially, and she pulled out her phone to take a video just before her husband began his own ascent up the ladder. He clipped off his souvenir, as he has four times before, and twirled it twice in his right hand before returning to the floor. He’d soon leave all the commotion behind and find a spot at the back of the locker room. There, he sat on a bench and checked his own phone while his players gathered in a circle to shout Oto Koto, Oh Bahamas—they say it’s a reference to a Nigerian relative of a teammate and the team’s win in the Battle 4 Atlantis tournament in November, but they refuse to go into more detail—before the head coach gave his postgame debriefing. This could be Jim Boeheim sliding by and, as he does, giving the ultimate one-finger salute to the system that tried to bring him down. Or it could be Boeheim getting a poetic reprieve. Your opinion on that probably depends on your opinion of Boeheim. The only sure thing is that it is a Final Four run befitting its coach: A team snarling its way to Houston, feeling the challenges of its season very personally and profoundly, while also remaining indifferent to outside opinions. It didn’t look like his team could do that Sunday, he admitted. But, Boeheim added, he also wasn’t planning on making the Final Four. And yet here he was, smiling, probing the postgame food in the locker room, and then walking toward the shower area and stopping only to issue freshman guard Frank Howard a few corrections. It was 8:14 p.m. and Jim Boeheim was coaching. His team had one more chance coming. And he’d squeeze everything out of it that he could.